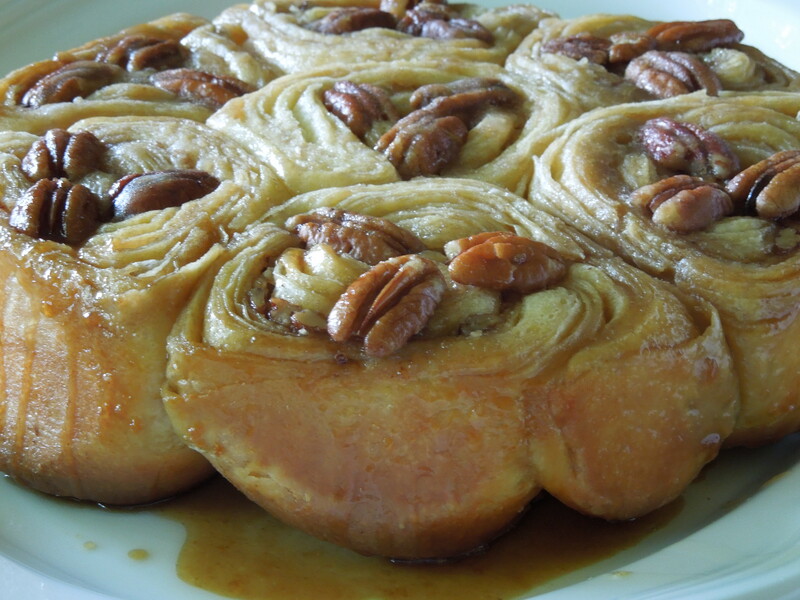 Imagine the most decadent recipe for brioche dough rolled with cinnamon sugar and pecans and baked with even more butter, sugar and nuts to form sticky buns. The recipe states, “these bear no resemblance to anything store-bought.” Probably not, because this was a a three day project for me: making the brioche dough, rolling and filling the dough, and slicing, rising and baking the buns. It was a lot of steps with a scary amount of butter. The end result is fabulous! 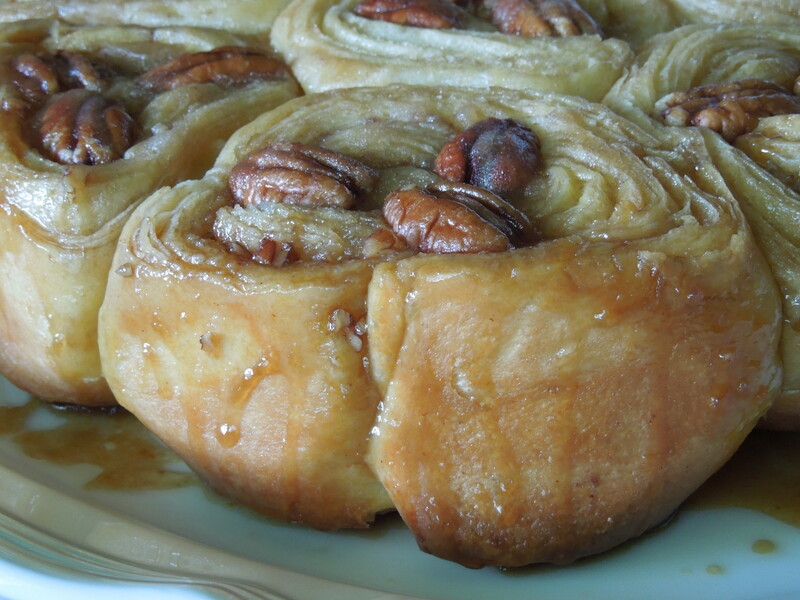 Everyone in my family loved these pecan sticky buns. You can find the recipe at these TWD hosts: Eat Drink Man Woman Dogs Cat and Cookies on Friday. 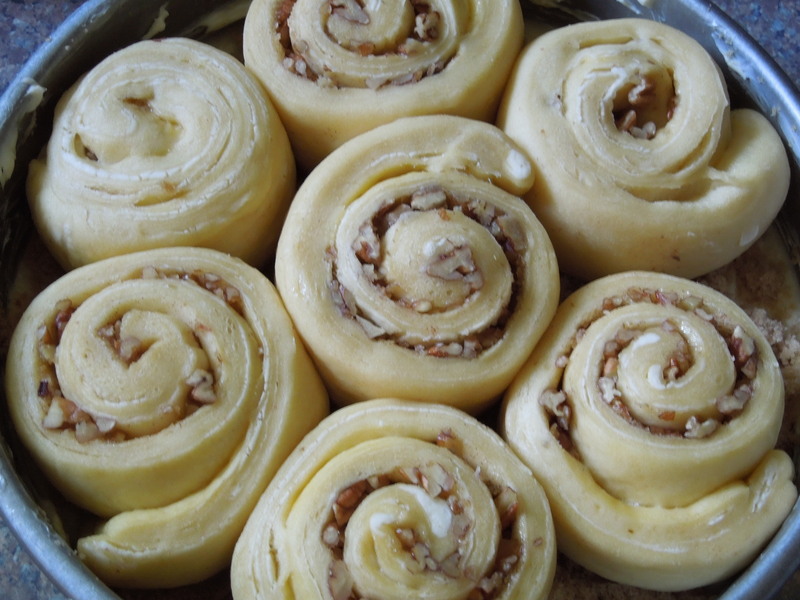 This recipe makes two filled rolls that slice to 7 sticky buns each. I baked one roll and have the other saved in my freezer. If you are not familiar with brioche it is a buttery and flaky bread that reminds me of a croissant. Although most accounts I have read state Marie Antoinette never said this, the famous phrase attributed to her “let them eat cake” actually refers to brioche. Brioche is seriously good enough to be compared to cake. It takes A LOT of mixing. I was a little worried that my stand mixer was not up to the task. I was also not confident enough to do this all by hand. So I spent the first day of this little project with my fingers crossed that my Kitchen Aid Artisan mixer would survive. It heated up quite a bit and tried to take a walk across my counter. But it made it though about 20 minutes of mixing. 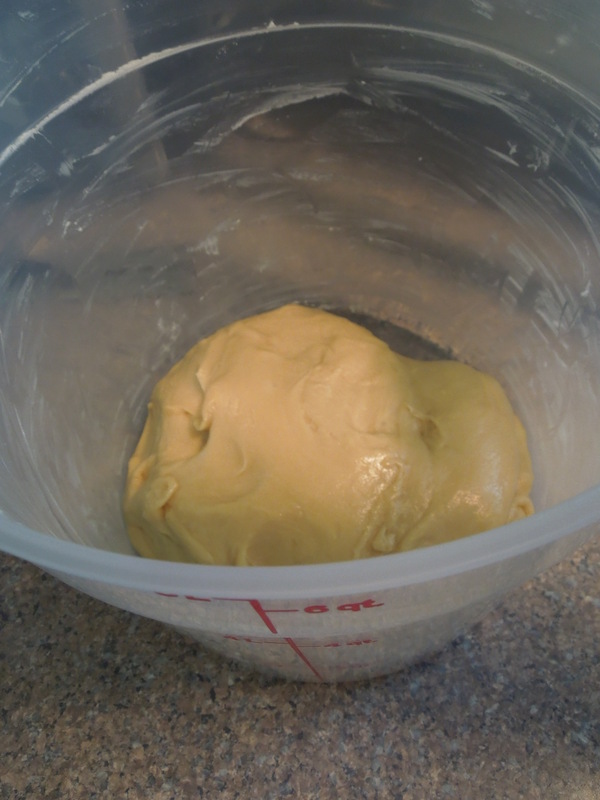 I ended up with a lovely dough that I let rise on my counter until it doubled and then I placed it to chill overnight in the refrigerator. 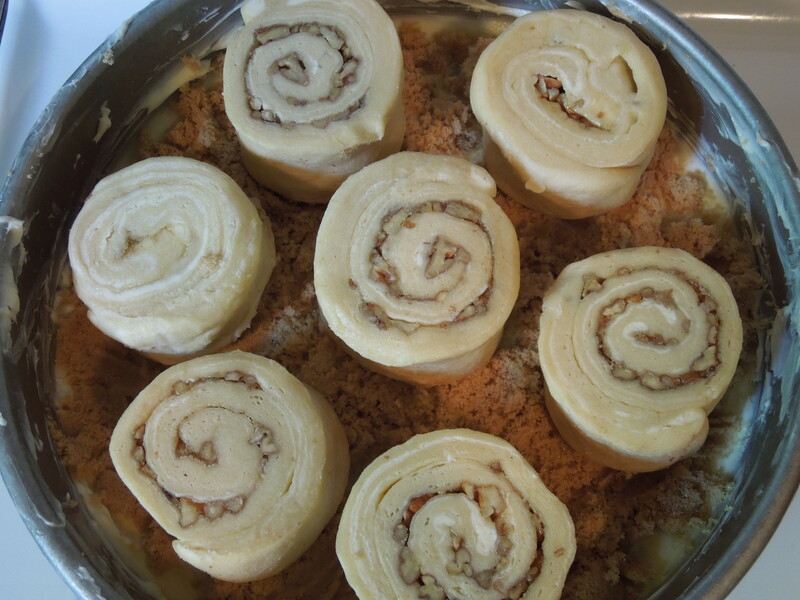 The next day I began rolling and “laminating” the dough. 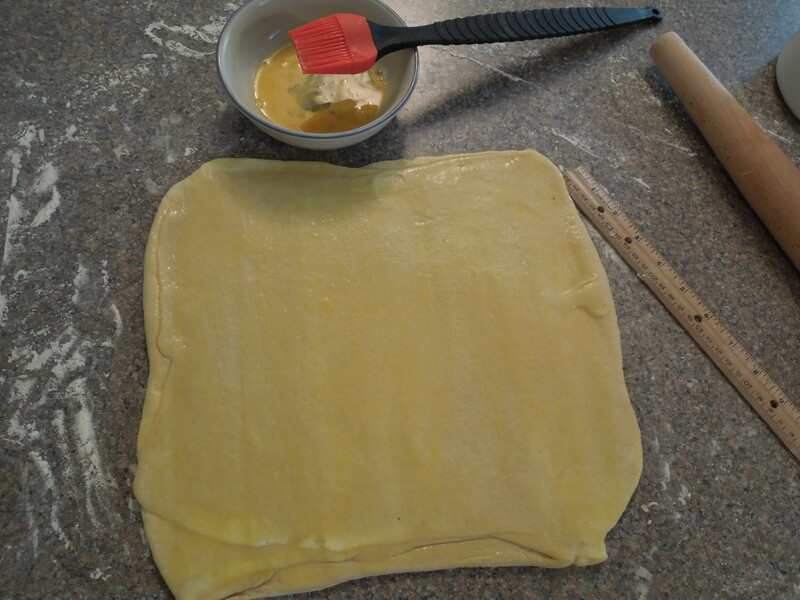 This involves rolling the dough out, dotting the surface with butter, folding the dough like a business letter, and rolling it out again. I don’t think I’ve ever used this much butter before! 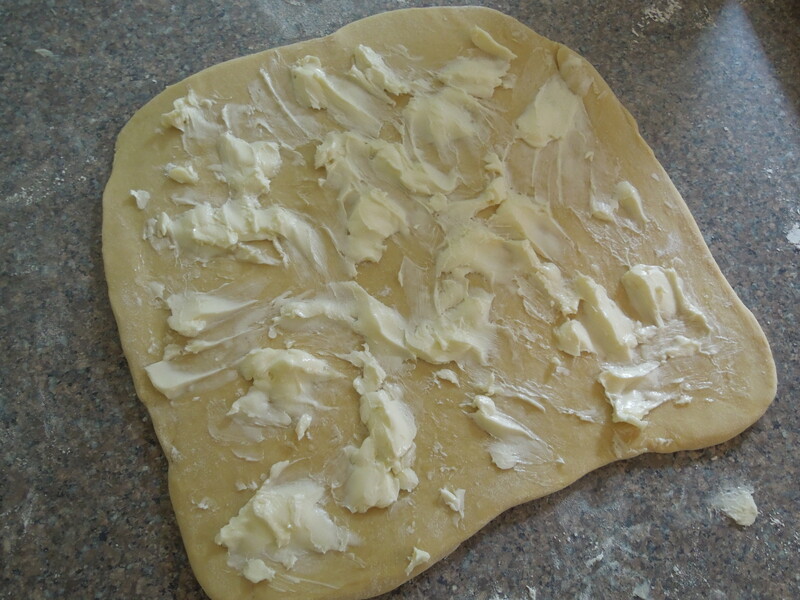 Incorporating butter this way gives the finished bread those flaky layers like puff pastry. Rolling dough is still a little tricky for me but I made it work and placed the dough back in the fridge so it could relax for a half-hour. 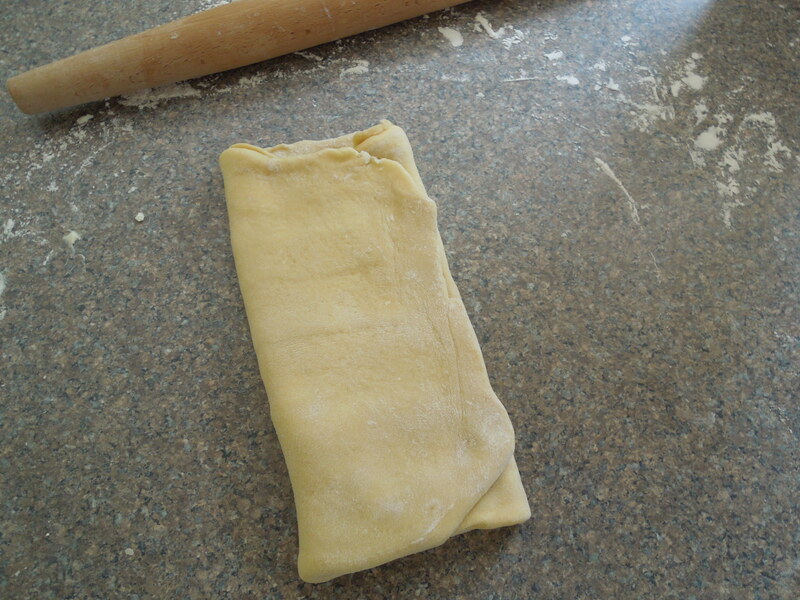 Then out again with the dough, roll it out again, and brush the surface with a lightly beaten egg. 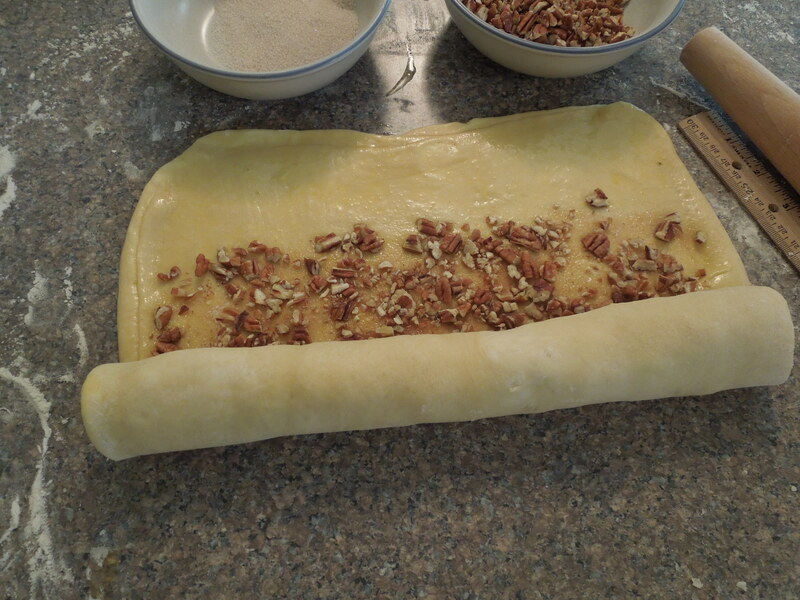 This egg is the “glue” for the filling of cinnamon sugar and chopped pecans, which are sprinkled on next, leaving the top quarter of the dough bare. 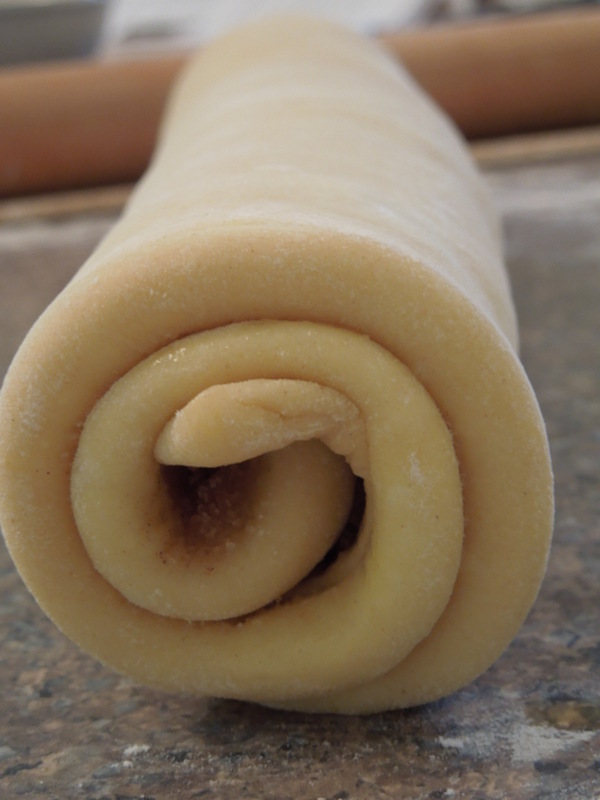 You gently press the filling with your rolling pin and roll the dough up into a log. Off to the freezer. You could wait about an hour and continue, but I double-wrapped my rolls and let them hang out in the freezer overnight. I pulled one of the filled logs out of the freezer and let it rest on my counter for about 20 minutes. While I was waiting I prepared my pan by smearing it with an entire stick of butter (gasp!) 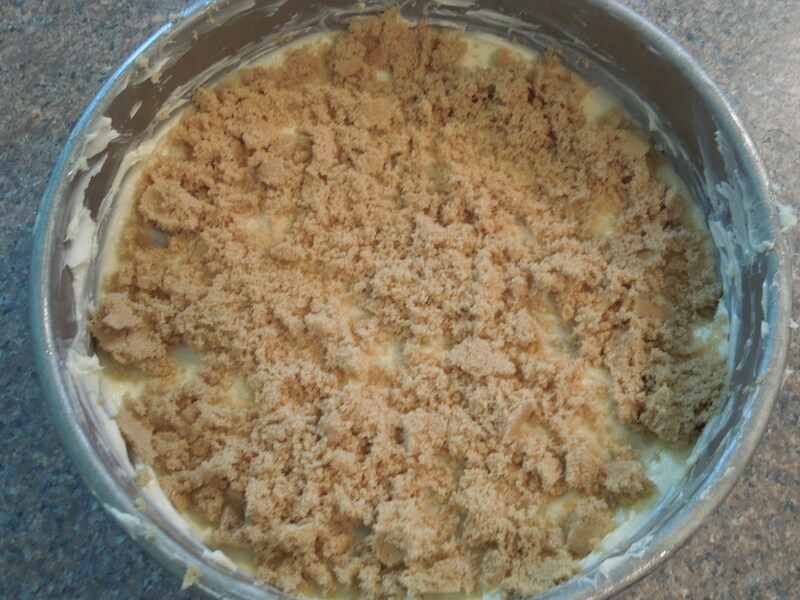 and a half-cup of light brown sugar. 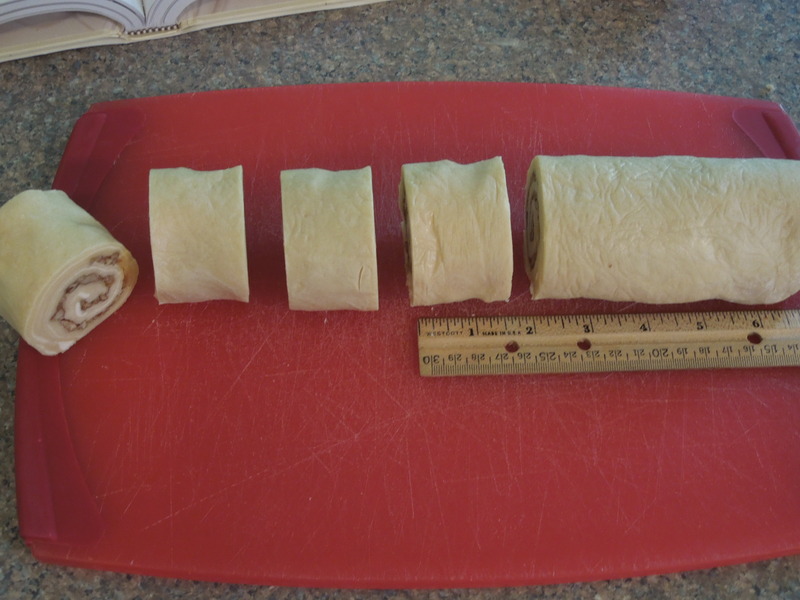 Then I sliced the rolls into 1 1/2 inch slices. I pressed three pecans into each one. I placed the slices into the prepared pan and let them rise uncovered at room temperature until the slices grew to touch each other. This took about 4 1/2 hours for me, longer than the recipe states. Before the last rise. . .
. . .after the last rise and ready to bake! I placed the pan into a 350 degrees oven and baked them for about 35 minutes. Immediately after removing the buns from the oven I inverted them onto a serving dish. I think next time I might cover the pan with foil to prevent overbrowning on that side and bake for a few more minutes to deepen the color of the top. The finished sticky buns are divine! My son was literally licking his dish after he ate his! I enjoyed pulling the flaky layers of the bun apart as I devoured mine. Yum! Although there was a lot of steps none of them are that difficult. This recipe just takes lots of planning ahead. Would I make these again? Absolutely! I think I need a more powerful stand mixer if I want to make brioche a regular part of my baking. I have a Kitchen Aid Artisan with a max 325 Watts. I’m also eyeing some bread machine recipes for brioche like this one from King Arthur’s Flour. What kind of mixer is powering your baking? What model should I put on my wish list? Let me know!